:Were you seeking information about the Azuremyst (US) server instead? 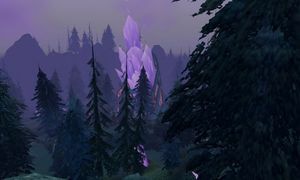 Azuremyst Isle, one of WoW's starting zones, sees the least amount of PvP action (along with Teldrassil) due to the fact that the only way for Horde players to get to Azuremyst Isle itself is via ship from Rut'Theran Village in Teldrassil. Other starting zones are directly accessible by the opposing faction without such hazards. For this reason, some draenei on PvP servers leave for the human and dwarven starting zones. Very little history is known of Azuremyst Isle and the surrounding islands. Not visited often by the night elves and tauren of Kalimdor due to their out-of-the-way location, the isles' indigenous creatures have been left to their own devices over the centuries. 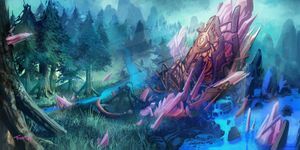 This is also the reason why the other races have not yet noticed the crashed dimensional ship that lies scattered across the islands, now used by the surviving draenei as a set of bases and outposts. Some civilization did exist on the island before the draenei arrived. On the southern Silvermyst Isle, a dock and house of night elf architecture marks the dwelling of a family of night elves who made their home here. In addition, a clan of furbolgs live in the central island. Due to being so far removed from their cousins in Kalimdor, these furbolgs have remained uncorrupted, though they have recently been driven out of their ancestral holdings. 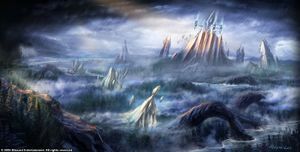 Additionally, ancient night elven ruins predating the Sundering are found scattered about both Azuremyst and Bloodmyst, all of them now inhabited by vile naga. The night elves have mostly abandoned these islands in favor of mainland Kalimdor. After the Cataclysm, rumors had spread that the draenei withstood the breaking of the world, and that refuge could be found on Azuremyst Isle. Human refugees arrived in lost humility at first, in ones and twos, by leaky boat and makeshift raft, risking the unknown to flee the horribly known. In the beginning, the draenei had aided as they could, giving the refugees a place outside the Exodar, healing them, and sharing food and water. But then the outcasts had begun sending out word to find their friends and families, and the call echoed throughout Kalimdor: "The Prophet holds Azuremyst safe. The Prophet foresaw the Cataclysm and will make everything right." and the refugee camp quickly grew and boasted a thousand exiles. When the draenei tested the nearly repaired Exodar, the refugees thought the draenei were going to leave Azeroth, and started rioting. The riots escalated and both human and draenei were wounded in the conflict. The riots were stopped when High Prophet Velen spoke collectively to both sites, and not long after the refugees started returning to their former homes, to help rebuilt the world after the Cataclysm. Arcane storms strike this peaceful area outside the coast of Kalimdor. Evergreens and purple flowers cover the land. The island itself is divided into two parts by a river running north-south, the eastern and slightly smaller region dubbed Ammen Vale, as it is sheltered by hills on all sides. To the south lies Silvermyst Isle, close enough to reach by swimming without difficulty, and small enough to be considered part of the main island. Azuremyst Isle contains no dungeons, raid dungeons, micro dungeons, or battlegrounds. 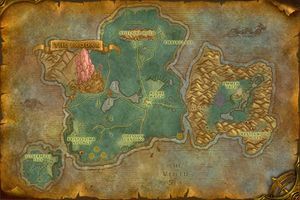 It is the starting area for the draenei and contains a 1-5 leveling area, Ammen Vale. The draenei city, the Exodar, can also be found in this zone with a flight path to Bloodmyst Isle. The mainland is accessible by boat from Valaar's Berth or by flight path from the Exodar, both going to Rut'theran Village. Thunderstorms, foggy nights are common in the area. As a Horde character you would have to fly to Teldrassil. From there you can take the boat from Rut'theran Village. Teldrassil 1-10 East By boat from Valaar's Berth or flight path from the Exodar. Bloodmyst Isle 10-20 North By swimming, walking and flight path from the Exodar. Azuremyst Isle is the new home of several notable people; not all of them draenei. At the Crash Site in Ammen Vale, Vindicator Aldar and Technician Zhanaa work tirelessly to keep in contact with other draenei scattered across the island. At Azure Watch, Exarch Menelaous watches over the people of the village. Admiral Odesyus, recently forced to land on the southern coast of the island, does his best to root out the traitors in his crew and help his new-found allies, the draenei. And High Chief Stillpine seeks aid from the newly arrived draenei to take back Stillpine Hold. 参见：Azuremyst Isle questing guide 参见：Azuremyst Isle storyline The quests of Azuremyst Isle range from the early level 1-5 quests of Ammen Vale to the level 5-10 quests of the main isle. Quests of note include the 模板:Questchain quest chain, in which draenei learn the language of the furbolgs; a quest chain involving Admiral Odesyus as he hunts down the traitor in his crew; and quests given by the furbolgs of Stillpine Hold. Many of the 1-5 quests are draenei-only, but the 6+ quests are available to any race. Map of Azuremyst Isle in a TBC preview. Foggy nights and thunderstorms are both common in Azuremyst Isle. Azuremyst Isle, like the nearby Bloodmyst Isle (and like Quel'Thalas), is implemented as a part of the Outland map, not part of Azeroth proper. This decision was made during the development of The Burning Crusade when it was still a separately sold expansion, to prevent players without the expansion from getting there. This is why it resides behind a loading screen. Players trying to get to Azuremyst Isle from mainland Azeroth by flying or swimming across the water, rather than by boat or flight path, will hit an invisible wall.